If someone went into Three Outlaw Samurai knowing only of its basic premise, they could easily infer that it is a straightforward action film. The setup the audience is presented with only reinforces this notion. A wandering hero espies a damsel in distress and must rescue her from a pack of lowlife louts. The audience is then blindsided when it turns out the peasants’ admittedly extreme actions are brought about due to sheer desperation. Matsushita is a textbook despotic ruler, remorselessly crushing those beneath him under his heel. The decision to capture Matsushita’s daughter, Aya, may seem dangerously reckless, but it’s the only way they could possibly get his attention. Suddenly, Shiba, who was ready to play the hero, finds himself joining his would-be enemies. This is your first cue that Hideo Gosha sought to play with the audience’s expectations, and it sets the tone for the rest of the film. Outraged over this slight, Matsushita sends his men to rescue Aya. Among the team is Kyojuro Sakura, a ronin arrested for vagrancy. The team proves particularly ruthless, easily dispatching several peasants on their way to the mill. As his rough appearance implies, Sakura was a farmer before he walked the road of a samurai. It is a combination of his background and learning of the peasants’ motivations that Sakura defects to their side. What I like about this plot point is that it forces Sakura to deal with the consequences of being under Matsushita’s employ. On the way to the mill, he kills one of the rebellious peasants. He is later forced to bear the bad news to the victim’s grieving widow. A sudden defection doesn’t erase this sin, and when he finally tells her the truth, she notably does not forgive him. Nonetheless, it is when he confesses that he manages to better himself and truly become a hero of the people. The third samurai the title of this film refers to is Einosuke Kikyo. His initial situation is the polar opposite of Sakura’s. While Sakura was one of Matsushita’s prisoners forced to do his bidding, Kikyo freely admits to sponging off of the magistrate. He enjoys the luxurious lifestyle that comes with being Matsushita’s lackey, yet isn’t willing to lift a finger when things get dangerous. Fittingly, what causes him to change his mind is when his master betrays him. The relationship between a samurai and his master is of utmost importance, and it’s when his master violates the trust that Kikyo joins the other two ronin. At first, you get the sense that he does it out of revenge, though by the end, it’s clear he has grown accustomed to his new role, seeing Shiba and Sakura as true allies. By 1964, Akira Kurosawa had emerged as one of Japan’s greatest filmmakers. Though divisive in his home country, his pioneering jidaigeki films such as Seven Samurai and Yojimbo are considered some of the greatest ever made. Whether the public knew it or not, his influence on the medium was profound. What made Seven Samurai especially laudable is that Mr. Kurosawa deconstructed the romanticized image of the samurai. 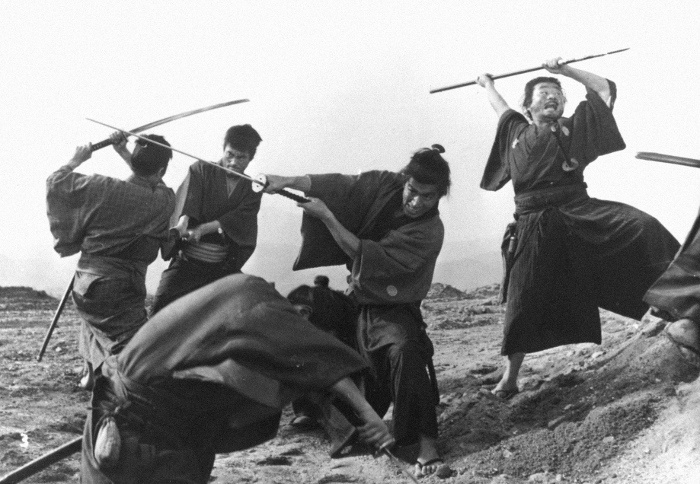 In his film, the samurai weren’t invincible warriors; they were real, flawed people. With Three Outlaw Samurai, Hideo Gosha goes about deconstructing the samurai code of honor – or bushido – in a much blunter manner. During a particularly heated hostage exchange, Shiba becomes a martyr for the peasant’s cause by accepting their punishment. Matsushita swears an oath from one samurai to another that the villagers will not be harmed. After Shiba is thoroughly beaten, the magistrate immediately goes back on his word and has many of the villagers executed. A major plot point of this film revolves around a petition drafted by the villagers. Because it would spell Matsushita’s downfall if it ended up in his lord’s hands, he will stop at nothing to seize it. The magistrate proves to be even more treacherous when the men he hired in the first place demand one-hundred ryō in exchange for the villager’s petition. When they arrive at the promised location to make the exchange, they discover – too late – that Matsushita sent two skilled assassins, the Shinigami, to meet them. To be slightly fair, the men didn’t actually have the petition and clearly intended to take the ryō and skip town, but it demonstrates it’s not just the powerless peasants who suffer because of Matsushita’s disloyalty. Kikyo realizing this is the impetus for his defection. A truly affecting moment occurs nearing the end of the film when Shiba rallies Sakura and Kikyo against Matsushita’s men. Miraculously, they manage to recover the peasants’ petition, but when Shiba attempts to tell the villagers to rise up and overthrow the magistrate, they refuse to budge. They’ve well and truly accepted their fate – even if it means enduring more hardships in the future. This prompts Shiba to charge Matsushita’s castle and strike the magistrate down once and for all. One final compliment I must pay this film is the symbolism surrounding its title. Three Outlaw Samurai doesn’t quite convey the meaning of the original Japanese title. The name of the film translates to “Three Samurai”, but it makes clever use of the counter system – a concept that doesn’t exist in English. Notably, the counter used to describe the samurai isn’t “nin”, but rather “hiki” (pronounced “biki” when combined with the Japanese word for three: “san”). While the former is used to count people, the latter is reserved for small animals such as dogs or cats. Much like Toshiro Mifune’s character in Yojimbo, the three outlaw samurai are frequently likened to stray dogs – an analogy that becomes especially apt when they decide to wander the countryside once their work is done. Interestingly, Three Outlaw Samurai began its life as a television series. The heads of the studio Shochiku were so impressed with his work that he had the chance to adapt his work into a feature-length film. This film is thus a prequel to the television series, acting as an origin story for its three leads. Because of this, Three Outlaw Samurai could be seen as a rough precursor to the superhero origin stories that would gain much popularity in Western cinema in the coming decades. It takes characters who were already well-known to the public and successfully fleshes them out even more. It’s a shame that Three Outlaw Samurai is so obscure in the West. 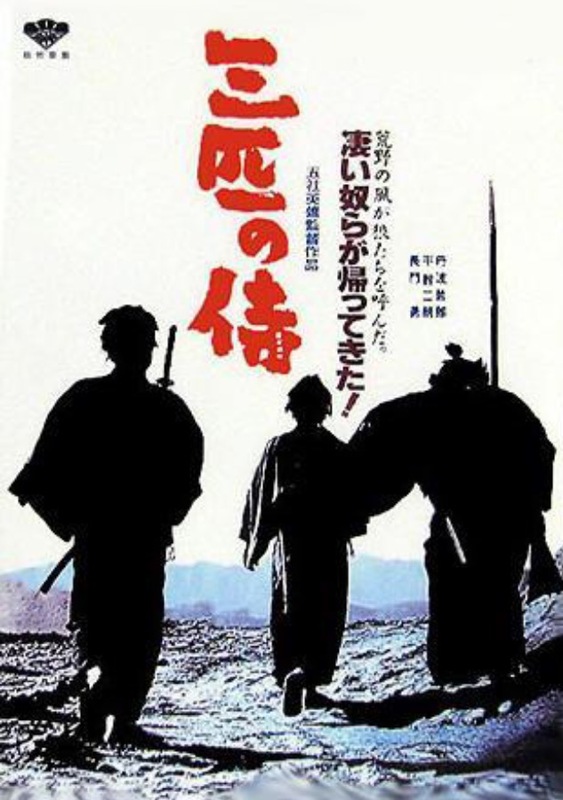 Though I wouldn’t consider it in the same league as Kurosawa’s most exemplary works such as Yojimbo or Seven Samurai, Three Outlaw Samurai is an underrated classic of the jidaigeki scene. If you’re looking for the kinds of Japanese sword fighting features that directly or indirectly influenced works such as Star Wars, you owe it to yourself to watch this film. Its short runtime and seemingly straightforward premise belie a lot of fascinating, well-thought-out story beats that are easy to appreciate even to this day.